Elevating children with special needs to reach their full potential by providing access to the resources and support they need to improve their family’s overall quality of life. Elevations was established in 2012 by committed medical professionals, families of special needs children, and community members who see too many children with physical and mental challenges who could be helped by therapy but who have limited or no resources to meet the cost. In November of 2013, we filled our first funding requests. 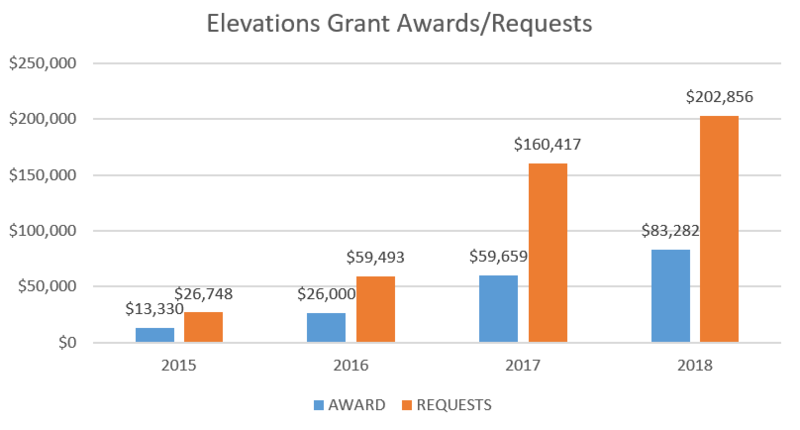 As of 2019 Elevations has served over 334 families in the local community having awarded over $246,658 to children in need of critical therapies. Elevations needs your help in serving the children & families in our community. In 2018 families requested over $202,856 in services to better the lives of hundreds of local children. Donations from last year allowed us to serve 125 families with total awards of $83,282 funded for therapies. Our goal is to fund 100% of requested therapies so families don’t have to choose between putting food on the table or ensuring their children get the help they need for healthy development and a fulfilling life. Please donate to help a child in your community. Interested in helping us? Check out the number of ways to get involved! Small Change = Big Impact. Roundup will round up your credit card purchases to donate your spare change! It’s easy, fast, and secure. Your pennies add up quickly especially when joined with other generous individuals who want to make a difference. Community fundraisers are a great way to support children with special needs. Elevations depends on dedicated volunteers to fulfill our mission. You can choose Elevations as your designated charity and Amazon will make us a donation! Link your Fred Meyer Rewards Card to Elevations and they will make a donation. Follow us on facebook to see how Elevations is helping the community.